The Zillertal in Austria’s Tyrol is loaded with great family ski resorts, Mayrhofen – Penken/Ahorn, Kaltenbach – Hochzillertal/Hochfügen, Zillertal Arena, Fugen-Spieljoch and Hintertux Glacier. 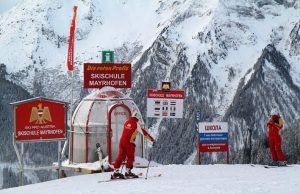 An Austrian family ski trip to this alpine rich region promises plenty of skiing and Austrian charm, great ski schools for kids and plenty to do après ski from rodeling (sledding) to touring inside the Hintertux glacier. Mayrhofen is the heart of the Ziller valley, part of the Zilleral Super Ski pass including 151 ski lifts and 508 kilometers of skiing. 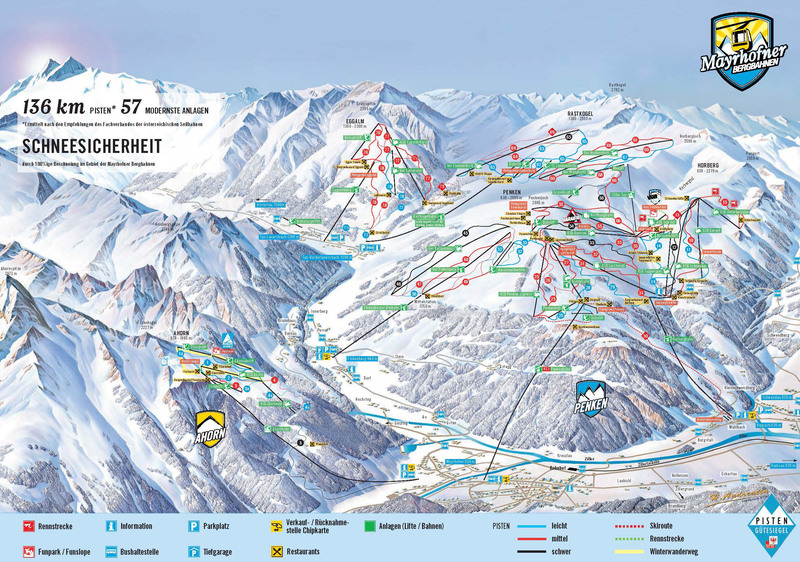 From the lively alpine village of Mayrhofen, you have combined skiing on two mountains – Penken and Ahorn – for a big total of 136 kilometers of prepared ski slopes, and 57 modern lifts and cable cars to whisk you around and up in every direction imaginable. Both ski mountains have family friendly terrain, well groomed pistes with snowmaking, fun parks and swift lifts to handle holiday crowds. In fact the $50 mill Penken gondola has heated seats and WiFi. 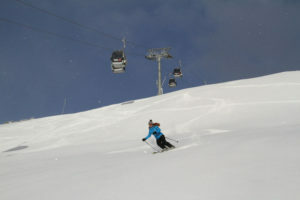 Six and eight passenger chairs with bubbles and heated seats flank most every side of Mayrhofen’s mountain which rises to 2,762 meters, 9,061’ at its highest on Rastkogel. For high level skiers, there’s plenty of off-piste here in a vast bowl, or ski the Harikiri – Austria’s steepest groomed ski slope at 78% grade, or 38-degree pitch. Horberg peak is very popular, with lots of well-prepared fun runs, and a cool mountaintop pyramid lodge serving lunch with a panorama. We suggest the charm of the Gschosswandhaus for a typically Tyrolean chalet lunch, you can also lodge overnight on the mountain here in a cabin – which sounds sublime. You can ski all the way to Eggalm and Finkenburg, all part of Mayrhofen closer to Hintertux, plus there is an entire other mountain across the valley – Mount Ahorn. Mount Ahorn has a distinctive A shape and craggy peak, but the terrain here is surprisingly tame family oriented. A long tram, Austria’s largest, take you to a high plateau of wide and sunny ski trails at 2,000 meters with great views of town and the surrounding peaks. 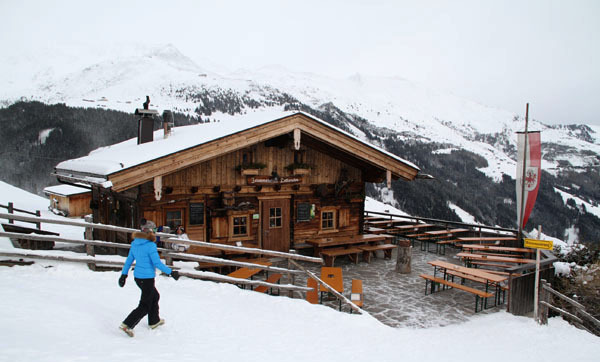 It’s a winter wonderland at Ahorn with an Iglu village and White Lounge where you can “chill” between ski runs. After skiing the upper mountain terrain of Ahorn, its a long long black diamond Ahorn Valley Run 5 kilometer run back to Mayrhofen, the full 4,500‘ vertical, or you can download in the 160-passenger Tram to enjoy the same phenomenal views of the village below. For lodging in Mayrhofen, Huber’s Boutique Hotel is a four-star hotel with ski room, sauna, excellent dining, located a few steps to the Penken gondola and to après ski in town. For a super fun evening, go to Tristenbachalm, a classic Tyrolean farm tucked in the valley, enjoy Austrian music and hearty soup and Weiner Schnitzel or ribs before descending back through the forest on a rodel sled. 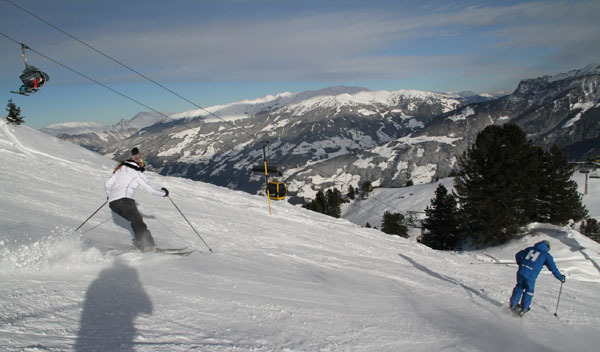 A family ski week in Austria’s Ziller Valley is easily reached from Innsbruck or Munich .